Presentations given at TechEd Orlando 2012 June 11-14 are online and viewable for free for everyone. Recorded sessions can be viewed and PowerPoint slides can be downloaded. Great that Microsoft makes the presentations available for free a few hours after the session has ended. VMware releases the presentations given at VMworld for free viewing 1 year after the event! If you like to download sessions for offline viewing go to SCOMfaq.ch. Here you will find a script which downloads all sessions automatically. Very handy. An overview of the sessions in the Virtualization track. Microsoft posted an updated poster which provides a visual reference for understanding key Hyper-V technologies in Windows Server 2012. This Hyper-V poster focuses on Hyper-V Replica, networking, virtual machine mobility (live migration), storage, failover clustering, and scalability. 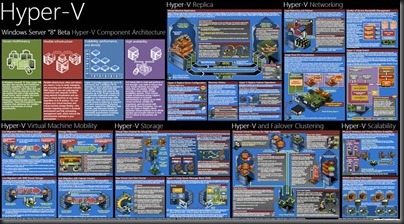 Microsoft earlier released a Hyper-V architecture poster on Windows Server 8 Beta. To find the differences (are there any?) have a look at this posting. 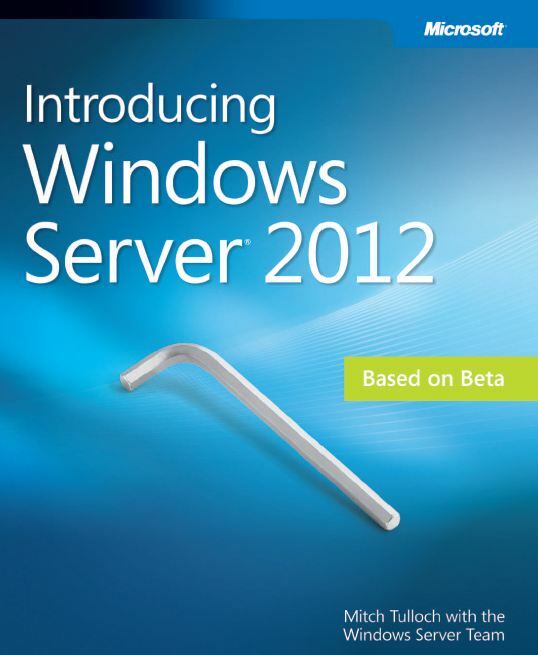 Windows Server 2012 is probably the most significant release of the Windows Server platform ever. With an innovative new user interface, powerful new management tools, enhanced Windows PowerShell support, and hundreds of new features in the areas of networking, storage, and virtualization, Windows Server 2012 can help IT deliver more while reducing costs. Windows Server 2012 also was designed for the cloud from the ground up and provides a foundation for building both public and private cloud solutions to enable businesses to take advantage of the many benefits of cloud computing. This book represents a “first look” based on the public beta release of Windows Server 2012 and is intended to help IT professionals familiarize themselves with the capabilities of the new platform. Although certain features may change between now and RTM, much of the basic functionality likely will remain as described here, meaning that most of what you learn from reading this book will continue to benefit you as you begin to evaluate and deploy Windows Server 2012 in your own environment. A major feature of this book is the inclusion of sidebars written by members of the Windows Server team, Microsoft Support engineers, Microsoft Consulting Services staff, and others who work at Microsoft. These sidebars provide an insider’s perspective, “direct from the source,” that include both “under-the-hood” information concerning how certain features work, as well as strategies, tips, and best practices from experts who have been working with the platform during its early stages.Sidebars are highlighted in the text and include the contributor’s name and title at the bottom. A picture is worth a thousand words“. This is very much true for explaining technology. Microsoft is famous for its detailed posters explaining Microsoft technology. Microsoft released a new poster showing the Hyper-V 3 components and features like Live Migration, Storage Migration and Replica. This poster provides a visual reference for understanding key Hyper-V technologies in Windows Server “8” Beta. This Hyper-V poster focuses on Hyper-V Replica, networking, virtual machine mobility (live migration), storage, failover clustering, and scalability. Microsoft will publish all sessions given at TechEd North America 2011 in May 2011 on internet! Those sessions can be viewed for free for everyone! Microsoft is delivering a great service to anyone interested in Microsoft solutions. Sessions can be viewed online about 24 hours after the session in Atlanta ended. See the sessions at the Channel9 website here. An overview of PowerPoint slides, videos can be found here. Microsoft recently released it’s free iSCSI Software Target. Very handy for demo, study and small production sites. WSV313 Microsoft iSCSI Software Target 3.3 for Application Storage, Diskless Boot, and More! 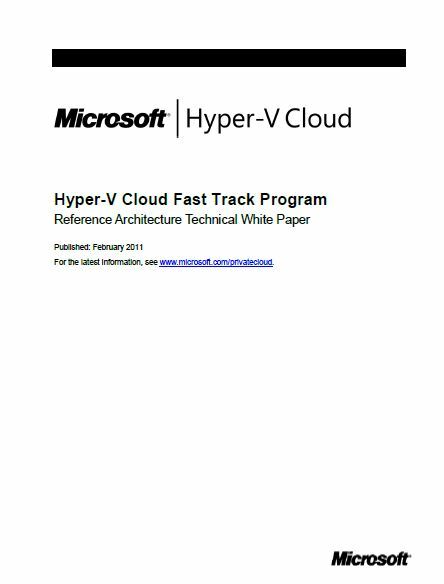 At May 16 2011 NetApp published it’s Hyper-V Cloud Fast Track reference which uses Cisco UCS for server and networking. 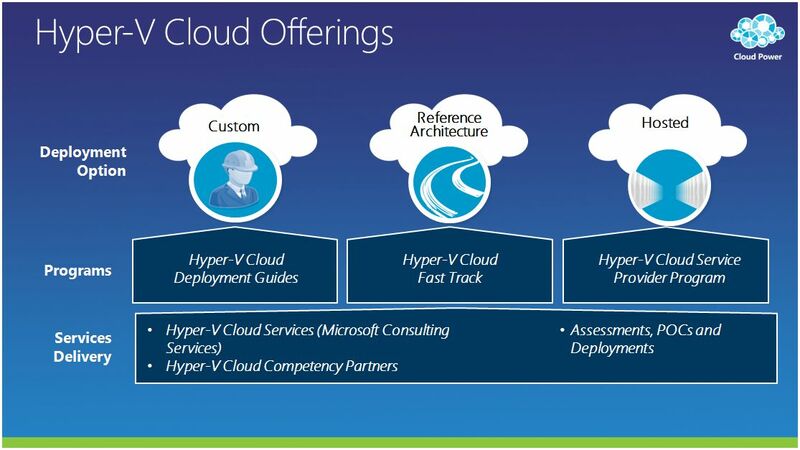 Hyper-V Cloud Fast Track is a solution which delivers a virtualiztion infrastructure delivered by vendors based on best practises of those vendors. Read more about the announcement of NetApp here. A video explaining the solution can be seen here. NetApp published a very detailed, 57 pages whitepaper full of best practises. It is a recommended read not only for Hyper-V design but also for any other virtualization solution. 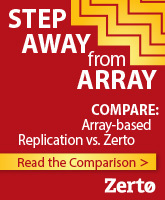 It gives good insight in Cisco UCS and NetApp storage. 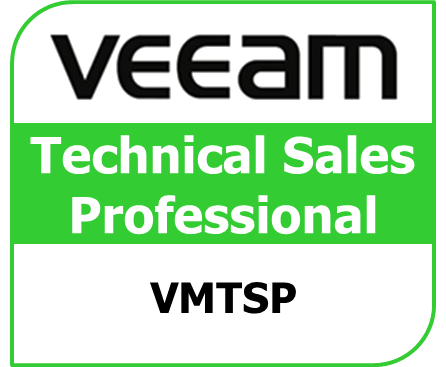 The System Center Team is pleased to announce the Beta of the Virtual Machine Manager Self Service Portal 2.0 SP1 (VVMMSSP 2.0 SP1). This public Beta is available through Connect. The VMMSSP 2.0 SP1 Beta allows an organization to abstract physical resources and assign these services quickly and efficiently. •Import virtual machines: Allows DCIT (Datacenter) administrators to re-import virtual machines that were removed from the self-service portal and also import virtual machines created outside the portal but managed by VMM. •Expire virtual machines: This feature provides the user the ability to set an expiration date for the virtual machines that are being created or imported so that the virtual machines auto-delete after the set date. This feature also provides users the flexibility (through role-based access) to set or change the expiration date for the virtual machine. •Notify administrators: This feature provides functionality to notify BUIT(Business Unit) or DCIT(Datacenter) administrators about various events in the system (for example, Submit request, Approve request,Expire virtual machine, and so on) via email through SQL server mail integration. •Move infrastructure between business units: This feature allows DCIT(Datacenter) administrators to move an infrastructure from one business unit to another when the system is in Maintenance Mode. This tool is available now, and we are very interested in your feedback. Check it out. Microsoft offers a three day, free webbased training on Microsoft virtualization concepts targeted at VMware professionals. The training starts at 10:00 AM PDT (Los Angeles timezone) and last till 16:00 PDT. This converts to 19:00 till 01:00 Amsterdam time. The webcasts are recorded so you can watch them on demand at a later date. Registration needs to be done for each of the three days and can be done using this link. Microsoft System Center Virtual Machine Manager 2012 (SCVMM 2012) is currently in a Community Test Program (CTP) which means the distribution of the software is limited to a select number of persons. Microsoft expects to release the software in the second half of 2011 with a public beta before launch. This posting in the third in a serie on SCVMM 2012. SCVMM 2012 will have a lot more functionality compared to the current 2008 R2 release. A new concept is private cloud, which enables the consumer of a cloud (the business) to easily provision, configure and use virtual machines. Another new concept is services: a group of virtual machines which act together to serve an application. Think about a webshop application which has webservers, application server and a database server. Lifecycle (create, update) of such a service is made very easy using new deployment software like Server App-V. These very interesting concepts are discussed in more details below. The information used in the posting is based on the presentation Microsoft gave during TechEd 2010 in Berlin. SCVMM 2012 is targeted at private clouds which means the available resources (computer, storage and network) are consumed by one organization. It is not targeted at public cloud with multiple tenants. The management done using SCVMM 2012 can roughly be divided in two levels. One level is the fabric management and the other level is the service management. 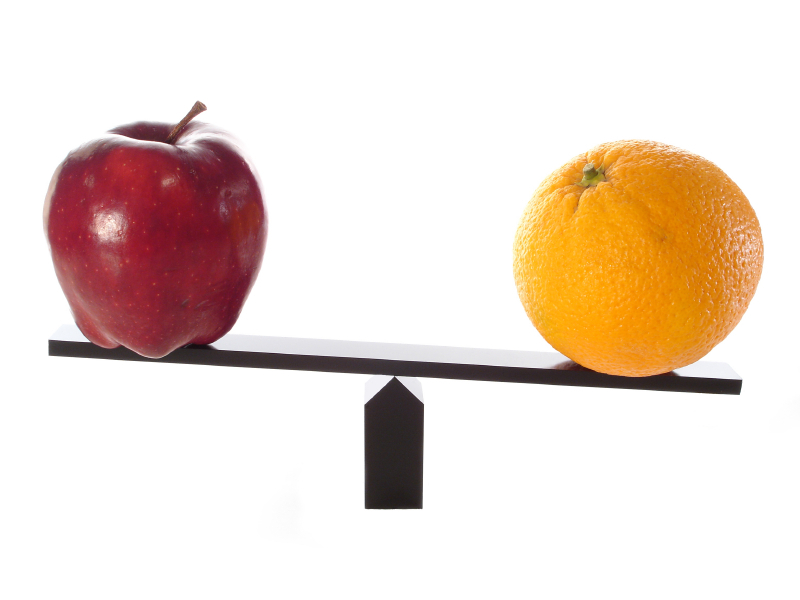 In a private cloud computing environment we see two types of roles. A producing role which is done by the IT-department and a consuming role performed by the business. Fabric management is the technical configuration of compute resources (deployment and configuration of Hyper-V servers but also VMware and XenServer servers), placement of virtual machines, network (subnet, ip configuration, vlan) and storage configuration (raid sets etc)etc. The producing role in a cloud (the IT-department) has to make sure everything is nicely connected and it operates as designed according Service Level Agreements. A private cloud is a new abstraction of the fabric. It hides the technical complexity of compute, storage and network from the consumer. Instead the consumer can easily select a functional network (production, test) and storage based on service levels (silver, gold etc). 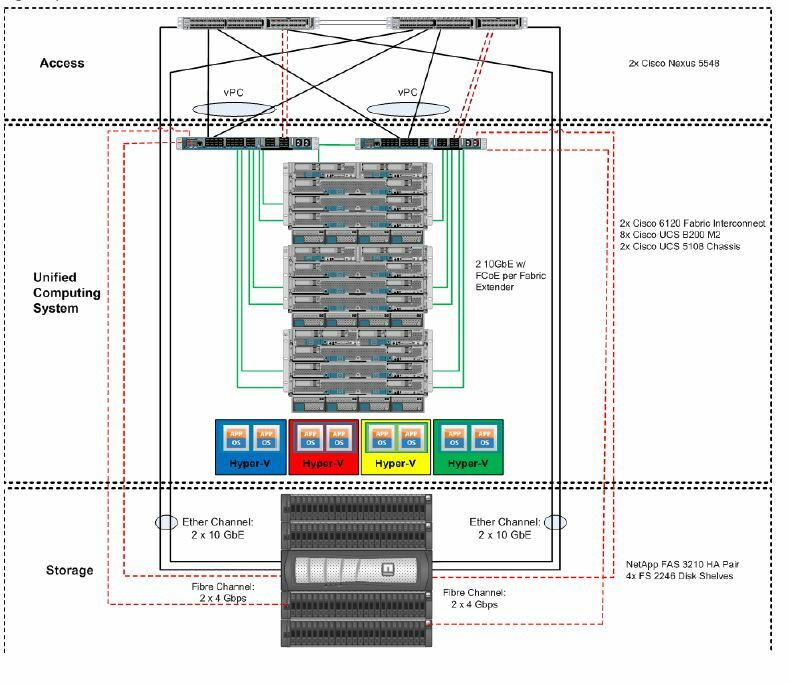 No need to know what VLAN’s, network interfaces or cluster shared volume to use. To manage the cloud several concepts are available. These concepts can be used to limit the cloud. 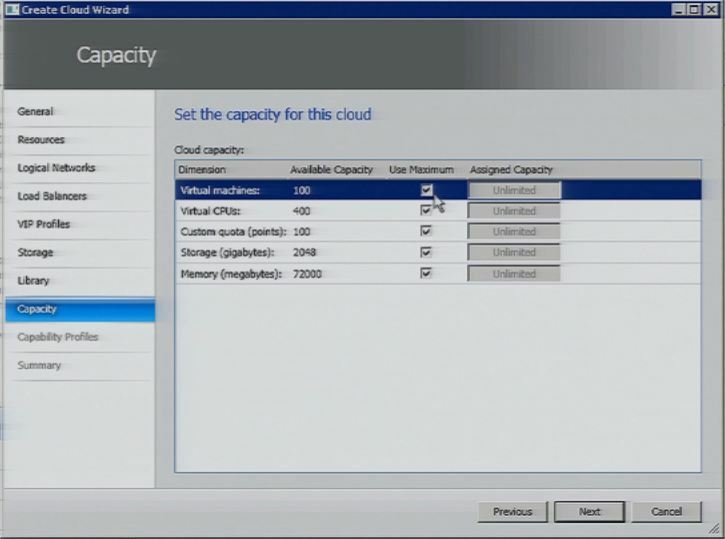 A capability profile defines the shape of VM’s that can be created in the cloud. For example the person who creates the cloud for the consumer can limit the maximum number of CPU’s of a virtual machine in that cloud to 2. Another specification which needs to be set when creating a cloud is the capacity of the cloud. This is a shared limit on dimensions like cpu, memory, storage and number of VM’s in the cloud. For example a private cloud can be created for use by the marketing and finance department. The capacity of the cloud can be 50 virtual machines. Users roles can be used to assign specific actions on specific objects to specific persons. There are three kinds of user roles available in SCVMM 2012: user roles for fabric management, user roles for cloud management and user roles for cloud consumption. For fabric management 4 user roles are supported: VMM admin or full admin, storage admin, network admin and read only admin which is for audit purposes. 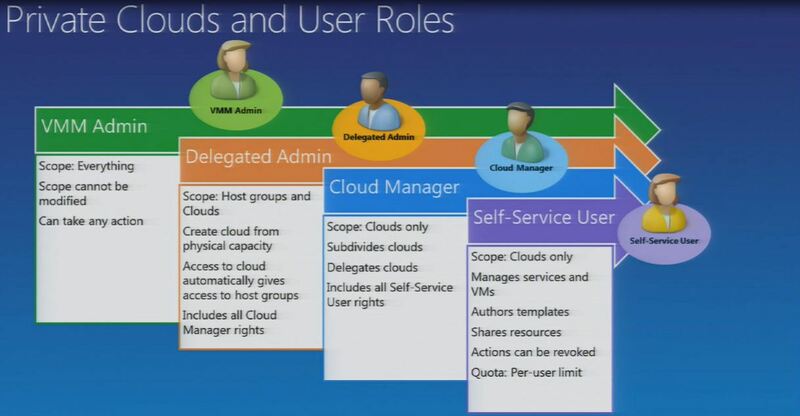 For cloud management one user role is available called cloud manager. For cloud consumption one role is available named self service user. This role can be assigned various actions, like starting, stopping and creating virtual machines or services. A VMM admin creates a cloud and delegates the cloud to a cloud manager. A cloud manager is for example an IT-manager of a business unit. The cloud manager sub-divides the cloud and assigns it to Self service users. The self service user creates VM’s and services in the cloud. Quota’s can be used to define limits on a per-user based on compute, storage, memory and number of VM’s. This can be set on the self-service user role. So in our previous example where a cloud was created for use by both the financial and marketing department, quotas can be used to limit to number of created vm’s for financial department to 20 and limit the maximum number of vm’s to be created by the marketing department to 30. Also new in SCVMM 2012 is the ability of self service users to share vm’s, templates, profiles and services to other users. To create a new cloud in SCVMM 2012 several steps needs to be taken. 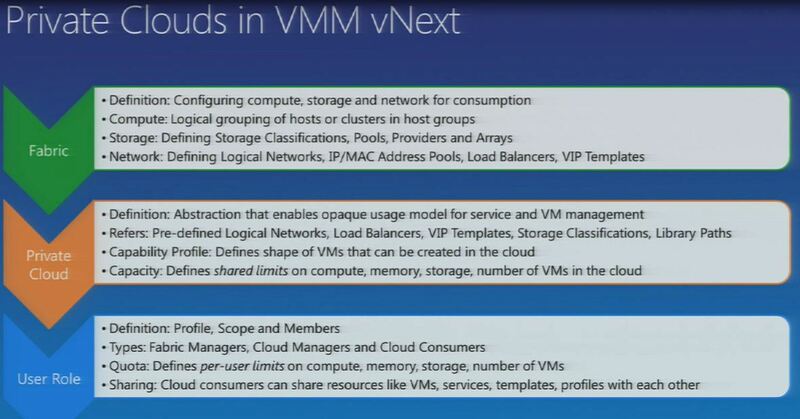 The resources needed for consumption can be offered by an existing cloud created earlier in SCVMM 2012 or by a host group (a number of Hyper-V hosts) or by a VMware resource pool. In the CTP version of SCVMM 2012 XenServer resources are not yet available for creating a cloud! Then the logical networks can be selected which will be available in the cloud. Logical networks can be for example ‘production network’ , ‘dmz network’, ‘test/dev network’ or a ‘storage network’. Then the loadbalancers and VIP-templates can be selected. Then the storage specifications can be selected like a high performance storage, silver storage, gold storage etc. The next step is adding the library where the template virtual machines are located. Next step is defining the limits of the cloud. The following dimensions can be set: number of virtual machines, number for virtual CPU’s, custom quota, storage in gigabytes, memory maximum . 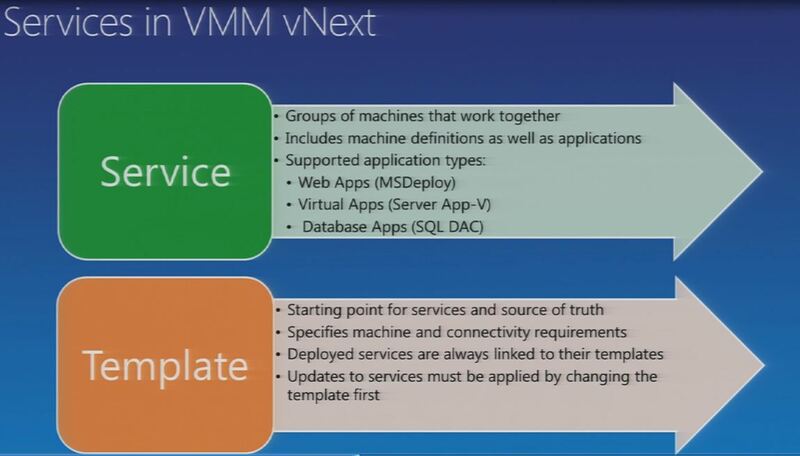 New in SCVMM 2012 is the concept of services. A service is a group of virtual machines working together. Think about a webshop application which often has a webserver, an application server and a database component. A service is also known as a multi-tier application. Where SCVMM 2008 was limited to provisioning the virtual machine and configuration of the Windows operating system, SCVMM 2012 adds deployment of applications to it. Supported application types are: web apps (deployed using MSdeploy) , virtual apps (deployed using Server App-V) and database apps (deployed using SQL Data-Tier Applications or DAC). Also scripts can be run to deploy applications. Server App-V is a new solution currently developed by Microsoft. It is very similar to the App-V targets at Windows desktops. Server App-V unties the application logic from the operating system. It will be available in the second half of 2011 before or at the same time SCVMM 2012 will be launched. To initially deploy a service first a service template needs to be created. The service template consists of one or more virtual machine templates. Each virtual machine template has information about the virtual hardware (number of CPU’s, memory etc), operating system (admin password, timezone etc) and application deployment (Server App-V, MSdeploy etc). Once a service is created from a service template, the service is always linked back to the template is was created from. Updates to services must be applied by changing the template first. This can be done to clone the template, rename the cloned template, edit it and deploy it. This allows rapid changes of services, like adding more servers to changing the virtual hardware specifications. A service template can be used to deploy virtual machines on a Hyper-V, XenServer and VMware vSphere hosts. SCVMM 2012 makes sure the most optimal host is suggested to deploy the VM’s of the service on. This can be manually overruled. A service template can have for example three tiers: a web tier, an application tier and a data tier. The webtier can have one to three instances, the app tier 1 to 2 and the database 1 instance. 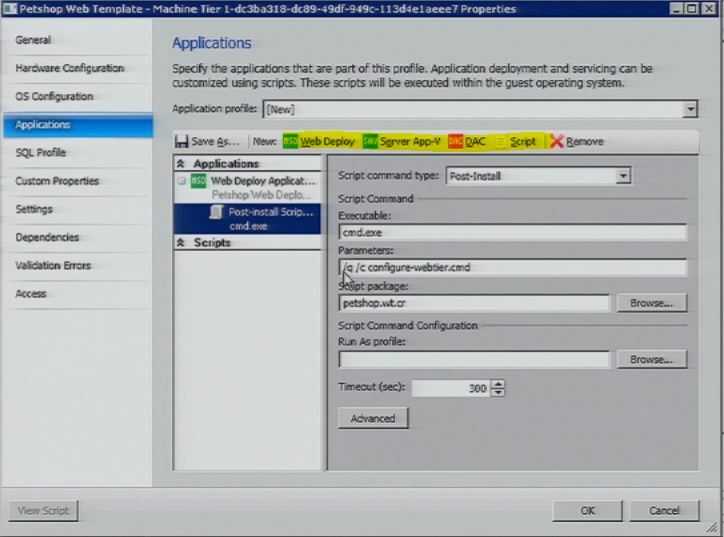 Each tier has three profiles: a hardware profile (how many cpu, memory), a os profile (admin password, time zone etv) and an application profile which is new in SCVMM 2012. 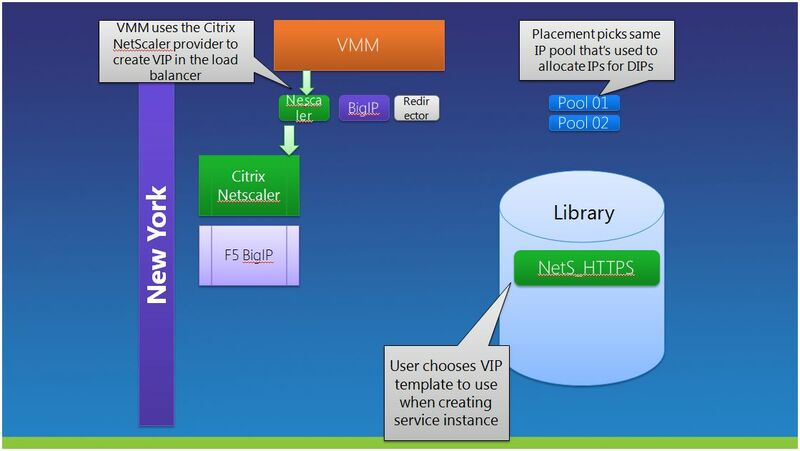 This defines the application packages and custom scripts to be deployed on the virtual machine. A service template can be created very easy using the service designer interface. A template is built using hardware, os and application templates. The service can be deployed to a host group, VMware resource pool or to a cloud. SCVMM will use intelligent placement to select the right hosts to place the virtual machines used in the service. SCVMM 2012 will also enable the installation of roles and features in Windows Server 2008. First clone the template. Then update the properties of the cloned the template like changing the size of the internal memory of a virtual machine. Two kinds of updating the service are supported in SCVMM 2012: Regular updating and image based updating. Regular updating are applied without replacing the OS image. Changes like increase the memory of the vm or update the version of applications are in the regular updating. Image based updating replaces an old image with a new image composed of operating system and applications. At november 14 2010 I reported on a new program based on Hyper-V called Microsoft Hyper-V Cloud Fast Track. 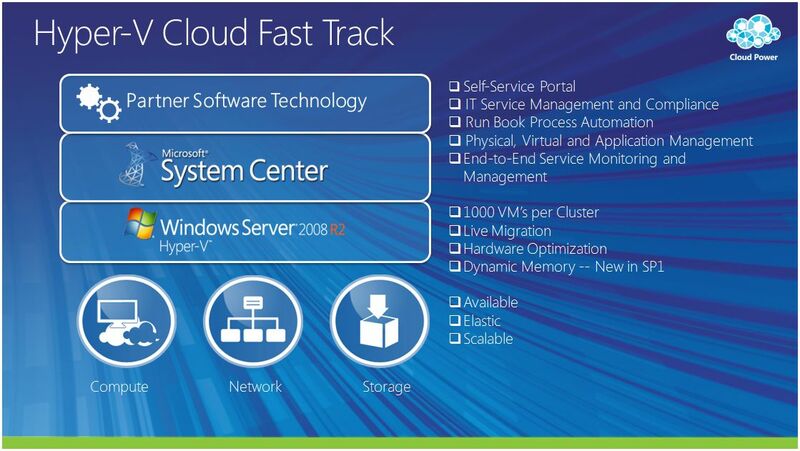 Hyper-V Cloud Fast Track is a complete turn key deployment solution delivered from 6 server vendors (Dell, IBM, HP are three) which enables customers to quickly deploy cloud computing with reduced risk for technical issues by purchasing a virtualized infrastructure designed with best practices of Microsoft and the hardware vendor. Customers can build the infrastructure themselves based on reference architecture or use one of the many partners of the server vendor. 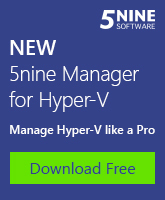 Hyper-V and Cloud in one solution name is interesting as currently Microsoft does not offer a real cloud computing solution for Infrastructure as a Service. Server virtualization, being able to run multiple workloads on a physical host and being able to manage the workloads and hosts is a less mature IT-infrastructure than a cloud computing platform delivering IaaS. So cloud in the name of the Hyper-V Cloud Fast Track should deliver more than just Hyper-V R2 and SCVMM2008 right? Well, it is now January 19th and it has become very quite since all the publicity around Hyper-V Cloud Fast Track in November. I tried to find any reference architecture which looks like a cloud solution but did not find anything new. Dell has some architecture based on Hyper-V and SCVMM 2008, which does not even get close to a IaaS or Cloud solution. So is Hyper-V Cloud Fast Track a real Infrastructure as a Service solution to quicky enable your own private cloud or is it just ‘ new wine in old bottles’ ? In the previous blogposting on SCVMM 2012 I wrote about the new features on loadbalancing virtual machines, powermanagement and automated deployment of bare metal servers to fully operational Hyper-V hosts part of a cluster. In this posting I will focus on the new features of SCVMM 2012 regarding networking and storage. The release of SCVMM 2012 will be the second half of 2011. SCVMM 2012 will have two main roles. It wil have a Service Management or Software based role which is focussed on the virtual machines and the applications running on the virtual machines. Things like lifecycle, self service, delegation and quota and capacity are handled here. I will create a seperate blogposting on these functions in the following days. This blogposting will focus on the second role of SCVMM 2012 being the Fabric Management. Fabric is the infrastructure or hardware used in the virtual infrastructure. That is servers, network and storage layer. Lots of new techniques and functions will be added in SCVMM 2012. Firstly the userinterface of SCVMM will have the the ribbon interface already known from Office 2010. SCVMM 2012 is able to communicate with the storage array using SMI-S providers. SMI-S (Storage Management Initiative Specification) is a standard management interface developed by SNIA to ease the management burden in multi-vendor SAN environments. SCVMM 2012 understands the storage layer all from the virtual machine hard disk file, to the VHD file, to the CSV volume and to the LUN at the storage array level. Because of this SCVMM is able to provision LUN’s at the cluster level and allocate storage to Hyper-V clusters all automatically. 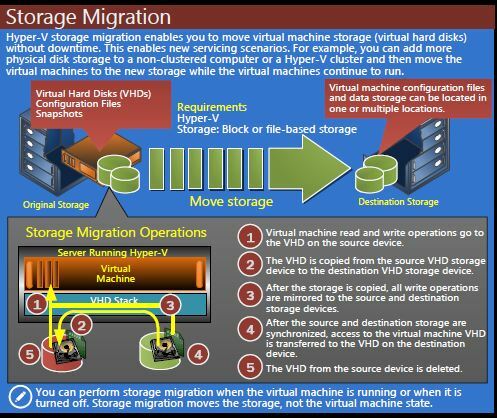 In SCVMM 2008 VDS hardware providers are used for storage integration. VDS will still be available in SCVMM 2012 but this will be the last release to support VDS. 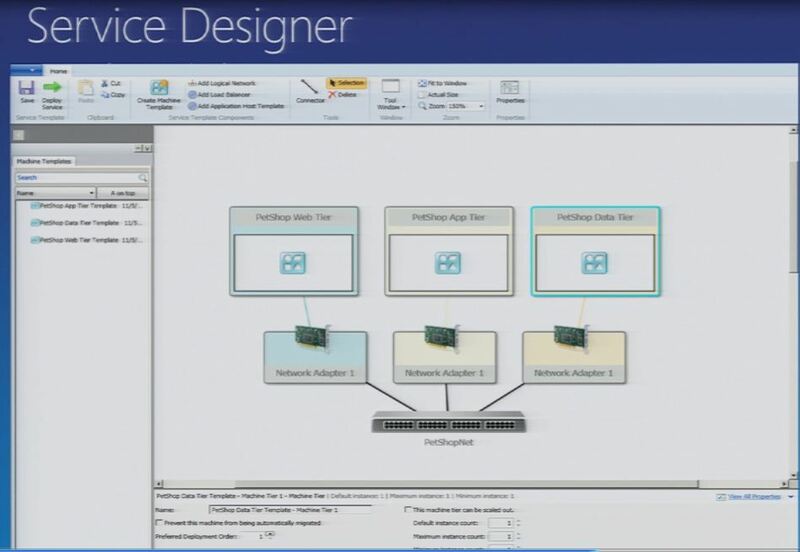 SCVMM 2012 will offer a new abstraction layer for networking. In private cloud computing persons creating the virtual machine are not IT-pro’s but can be endusers, developers or application owners.They are not aware of VLANid’s or IP-subnets. They just know a virtual machine needs network connectivity to for example the production network, to the backup network or the TestDev network. When virtual machines are provisioned from a self service portal the non IT-pro can easily choose the correct network using the logical network name. The SCVMM administrator creates the logical network and assigns an IP-subnet and VLANid to it. 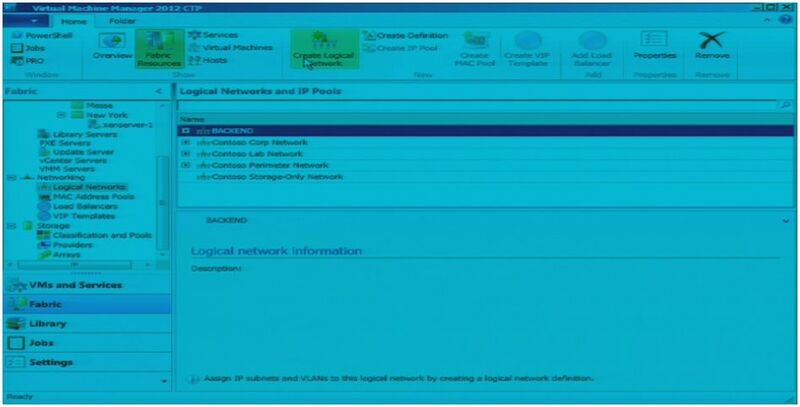 The IP-address of the virtual machines created in SCVMM is obtained from an IP-pool defined inside SCVMM 2012. This function can be compared to a DHCP server. In the IP-pool the IP-addresses of DNS servers and WINS can be assigned as well as the DNS suffix. Similar to the configuration of a DHCP-server. I am curious how this will work out with current Microsoft and non-Microsoft DHCP-servers used for assigning addresses to physical servers in the network or other DHCP-enabled devices. Enterprises often use some sort of centralized IP-management tooling for all of their devices not being perse a Microsoft DHCP-server. Using SCVMM 2012 to assign IP-addresses to virtual machines could easily lead to double IP-addresses if procedures are not followed. -A VIP address or Virtual IP address. This address can be assigned by SCVMM 2012 to certain hardware loadbalancers. Suppose a three tier application is used, consisting of a multiple webservers, a frontend server and a database backend server. The VIP address can be used to dynamically connect to one of the webservers running as a virtual machine behind the load balancer. 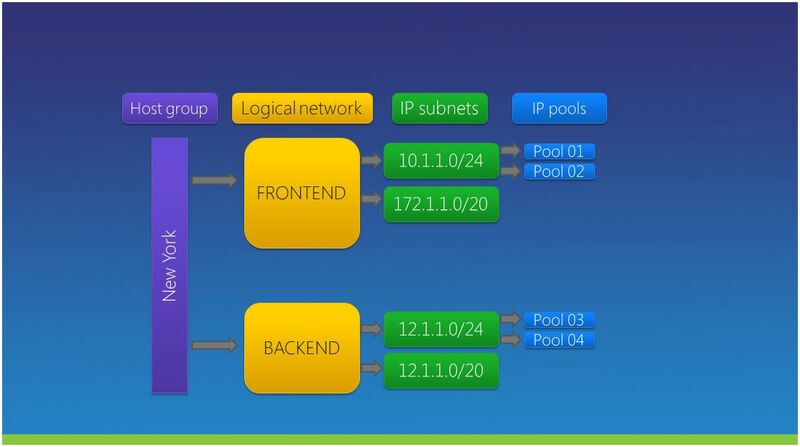 The IP-pool supports both IPv4 and IPv6. When a virtual machine is created, an IP address is checked out of the IP pool. As soon as the virtual machine is deleted the IP address is checked into the IP-pool. For MAC addresses there is a pool as well. In SCVMM 2008 there was a global pool of MAC addresses. In SCVMM 2012 a pool can be associated per host group. When a VM is created a MAC-address is checked out of the pool. When a VM is deleted the MAC-address is checked in. A newly created virtual machine can be reached via a VIP address which is assigned to a certain loadbalancer by SCVMM. For VIP addresses there will be a new template called the VIP-template. Settings on the loadbalancer like Protocol, Load balance method persistence are configured in the template and communicated via Powershell providers to supported loadbalancers like Citrix Netscaler and F5 BigIP. When the VM is created the VIP is checked out, at deletion of a VM the VIP is checked in again. SCVMM 2012 provides rapid provisioning. When a new VM is created using template, the VHD files do not need to be copied over the network but are copied by the SAN from a template. Most other copy actions are SAN to SAN as well and no data is copied over the network. When a template is ‘SAN Copy’ capable, at creation of a virtual machine using a template, there will be no network copy. Regarding support of ESX and vCenter there is a change in template usage. At SCVMM 2008 the VMDK of the template was copied during provisioning of a VM over the network which is a slow process. In SCVMM 2012 the template in vCenter Server located in the datastore is used to create a VM.